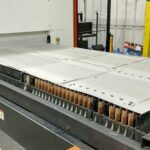 Dolphin Sails has installed a new Blackman and White Mastercut heavy duty automated flatbed cutting machine at their Harwich sail loft which they claim is both improving productivity and saving costs. 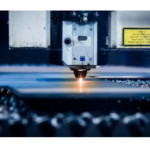 The Mastercut has a multi-tool head that holds both a knife blade and a laser cutter so one machine can be used for cutting a wide range of materials without having to change tools. The Mastercut has a 3.2 x 14 metre flat bed which means Dolphin is now able to handle much larger patterns for all their sails and covers. 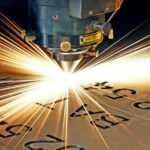 The laser cuts with an accuracy of ±0.02mm, and as it’s not in direct contact with the material, it means that even though it operates at speeds up to 1100mm/second, there’s no dragging of the material so cutting is far more accurate than with a knife. Fully automated nesting algorithms allow patterns to be laid out to the exact material width in seconds saving time and reducing wastage even further.